Many thousands of tourists and backpackers flock to Indonesia for its sunny climes, tropical beaches, and lively nightlife. Resorts like Bali are a favorite for visitors looking for that combination of bars and beach, but what if you’re looking for something more unique, and off the beaten path? Read on for our review of Padar Island Tourism. Padar Island is a tropical island paradise largely unspoiled by touristic development. Part of the Komodo National Park, it is the third largest island in the reserve, situated between Komodo and Rinca Islands. The time to visit Padar is anytime between April and November, as for the rest of the year it is the rainy season and the seas can get quite stormy. However, we chose to visit in October, when the peak summer season and hot and humid weather had passed. In addition, during the hottest time of the year, the grass and plant life fades to brown, so the best time to visit is either before or after the summer when the foliage is lush and green, and you can get the most colorful photos, which is why we chose October for our review of Padar Island tourism. During our trip to Indonesia, we were determined to stray off the regular tourist and backpacker trail as much as possible and seek out the truly wild and magnificent areas of the country, from a beach to coast to the mountain. We were eager to explore the Komodo National Park, but so many of the experiences involved the usual guided tours on daytripper boats specifically to see the Komodo Dragons on the biggest island of Komodo. 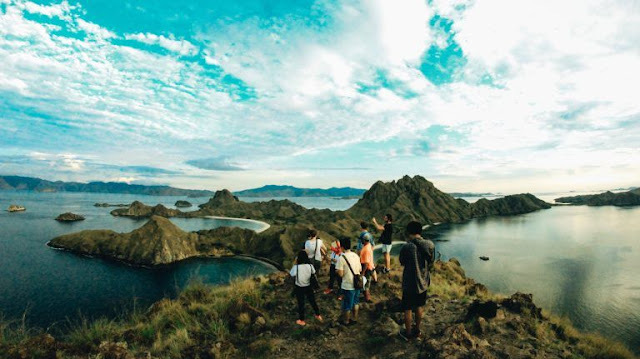 Therefore, as soon as we read about Padar, we knew it was a must-see for us. You reach the Komodo National Park via Flores, the main island of the area boasting the only airport. Flores is also where you’ll find the bustling area of bars, hotels, hostels, and restaurants. You will need to book a flight to Flores from Bali on Wings Air. There are three flights daily, each of which takes around 90 minutes. Once on Flores, there are many operators to choose from, offering everything from sightseeing tours to snorkeling and diving trips. However, we recommend that you ask to see the boat before you pay for the trip, as some are in a sorry state of repair! We had been strongly advised to catch either the sunrise or sunset from the island, so for our review Of Padar Island tourism, we decided to join with a small group to take the trip on an overnight boat. It takes four hours to reach the islands of Komodo National Park. Of course, we had to stop off at Komodo Island in the afternoon to see the Dragons when they’re most active. After taking a few photos of these prehistoric-looking reptiles, we continued on to Padar. Even from the water, first impressions of the island are breathtaking. Once you land on one of the deserted beaches, it’s essential to hiking to the islands highest peak for the spectacular views. Time it so that you catch the sunset whilst up there. The hike takes around half an hour, but be sure to wear sturdy shoes. Flip-flops or sandals aren’t appropriate footwear for the climb. We spent a pleasant evening on the boat eating BBQ fish in the open air, and though the beds weren’t exactly five-star, after the long day’s activities we all slept well. In the morning, we woke up to a few hours of snorkeling on some stunning colorful reefs, before beginning our journey back to Flores. If you’re just looking for a relaxing holiday, a visit to Flores might be enough to satisfy, with all the beach, bars and restaurants you need. If you’re more of an adventurer, we can’t recommend a visit to Komodo National Park and Padar Island enough. It’s a long trip, but surely worth it. We hope that this review of Padar Island Tourism has been helpful.